Handcuffs are standard security and law enforcement tool is used for controlling or restraining suspects. Law enforcement forces such as police, military, and special operations team routinely use handcuff at their work. As officers are liable to use handcuffs, so they have to take great care of it. To prevent unwilling miss out of handcuffs, officers use the best handcuff case for the security. Again, holding the cuffs barely in any place of duty belt or dress pocket for a day long will cause discomfort and may occur injury too. A handcuff case is a great solution to keep the cuffs secure and allows no movement until the cuffs are released. As handcuffs are used to restrict and restrain the movement of persons have committed an offense or violence, so in operations, if the cuffs are not applied instantly, it could occur an injury to the enforcement professional or give a chance to the criminal to escape from the spot. Therefore, handcuff case plays a vital role to provide safe and easy access to your handcuff instantly during the emergency. Again, applying the cuff in a correct manner ensures that muscle memory takes over in high-stress situations also. So, officers require some practice to get easy access of the handcuff from the case. These handcuff case easily adjust on duty belt through a loop that prevents them from coming out to ensure secure rest of cuff as well as offers quick access to the handcuffs. Even in multiple foot pursuits through steep terrain, open fields, wooded areas, urban areas you will never have a come out of cuff due to these cuff cases. Bianchi 8034 open handcuff case is a good looking as well as durable for one pair standard handcuff. It features a pull through style for easy access to the cuffs. The dual web belt loop design with trilaminate construction and 600 deniers woven finish can hold one pair standard handcuffs. It can easily fit on both 2″ (50mm) and 2.25″ (58mm) belts. The incredible quality of this open handcuff case is admirably suited to the handcuffs to hold the cuffs in without any Velcro or button fastener. The handcuffs fit snugly to it that you feel comfortable and protected even when you are jogging or running so far. Again, it is not too tight to remove the handcuffs when necessary. This simple open case works excellent indeed. No Velcro or button fastener. Bianchi Patroltek 8001 handcuff case features contour-molded technology and unique trilaminate construction. This Patroltek law enforcement accessory is made of highly durable 600 deniers woven exterior, high-density foam core, and a smooth knit lining. 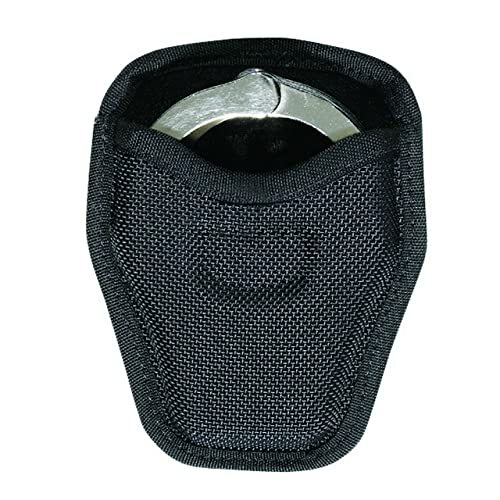 This one pair standard handcuff case with dual web belt loop conveniently fits 2″ or 2.25″ belts. It has a slot on the top flap to hold an extra cuff key and utilize a hidden snap closure. It features key ring snaps on the interior of the lid for easy accessibility. It provides function and wears for duty to the law enforcement authority without going over budget. This handcuff case can easily hold – S&W Model 1, Peerlees 5030, ASP Model 200 Hinged Tactical, Hiatt 2003-H,2005-H, 2054-H, and 2055-H model cuffs. Comfortably fits 2″ to 2.25″ width duty belts. Bianchi Accumold 7334 open case offers a pull-through style for easy access to the cuffs. 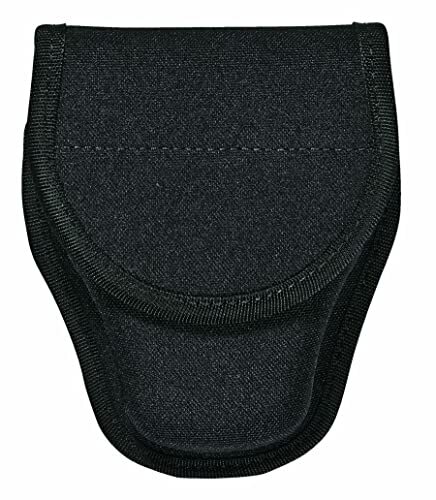 This open handcuff case fits both 2″ and 2.25″ belts as well. It is made of 100% synthetic laminate nylon material which accommodates one pair standard handcuffs. 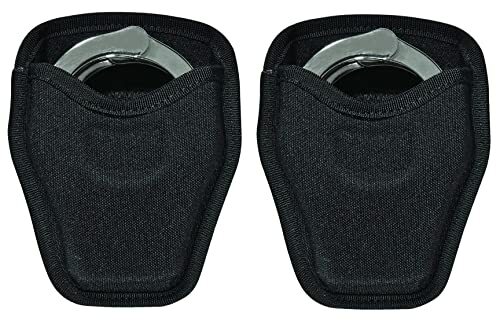 Though this case is intended to be used with standard (linked) handcuffs, it works great for the standard Smith and Wesson hinged handcuffs as well. You can also get your Peerless hinged in this case, but it is a little bit tight fit to pull out in a hurry. This cuff case is very durable and textured. This case holds the cuffs exceptionally well, so this case will be the best handcuff case that you ever had. TTGTACTICAL Hidden Snap Handcuff Case is a perfect police style handcuff case which fits the standardly sized cuffs. This is a very tough and durable case that utilizes a hidden snap closure. 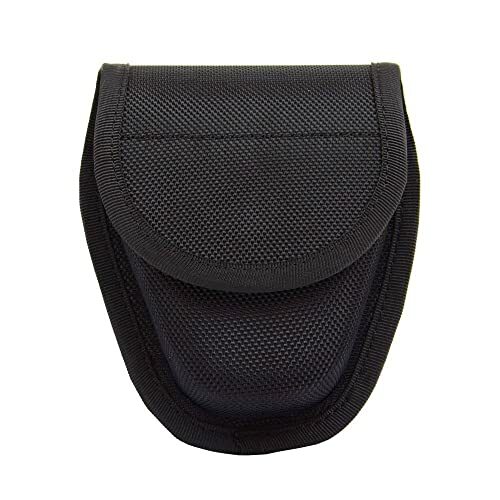 This black handcuff pouch with high-temperature molding ensures long-lasting shape and precision fit. It offers dual web belt loop which easily fits 2″ and 2.25″ width duty belts. This police style handcuff case is made from the 1680D nylon woven finish as well. This cuff pouch measures 8 cm tall, 8.5 cm wide and 6.9 cm thick. 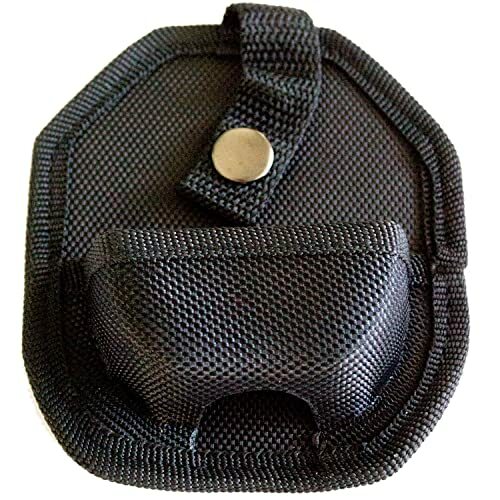 This is a double cuff pouch that offers a divider to keep the cuffs free from rattling. It works great at all. The enforcement professionals such as police, military and special operations team don’t want to make mistakes in choosing the handcuff case. They don’t want to take any risk as their life depends on it. So, they don’t settle for consumer grade handcuff cases. Best Black Handcuff Case is an original “under control tactical” handcuff case that features industry-leading, professional-grade and durable nylon construction. Top law enforcement professionals trust this lightweight and heavy-duty handcuff cases. This professional grade model is perfect for handcuff concealment. The extremely durable nylon construction made to last a lifetime. This lightweight case measures 4.25″ wide X 4.5″ tall X 1″ thick and 5 oz weight. The long-lasting 100% nylon rugged handcuff case is crafted to the absolute highest standards that ensure 100% secure control of your handcuffs. This case is developed as a universal fit for all popular handcuff models like- Peerlees, Smith and Wesson, Mtech, Takedown and others. Just like the professional grade cases, it assures comfortable to wear or rest on your belt. It is strong enough to absorb heavy use as well as abuse on every single day. This under control tactical handcuff case helps you to handle the “life or death” situation too. We recommended you to buy this case with complete confidence and hope you will love it so much that you will want to buy more than one. Choosing this product is a smart decision indeed. If you are a law enforcement professional, then handcuff is an essential tool for your duty. The secure rest of your handcuffs is the most important thing to prevent unwilling miss out of handcuffs. A best handcuff case will protect your cuff from a drop out even indulge in hand to hand fight. Buying a handcuff case is not a complicated process, it is easy as making any other purchase. We made a list of the five best handcuff case from our research and broke down their pros and cons. This will help you to minimize your effort and time to make an informed decision for finding the best one as you need. So, before you buy, ensure that you look at our review for the best handcuff case. The 10 Best Tactical Scope Under $1000 – Long Range Scopes 2019 Having the right weapon can make all the difference.